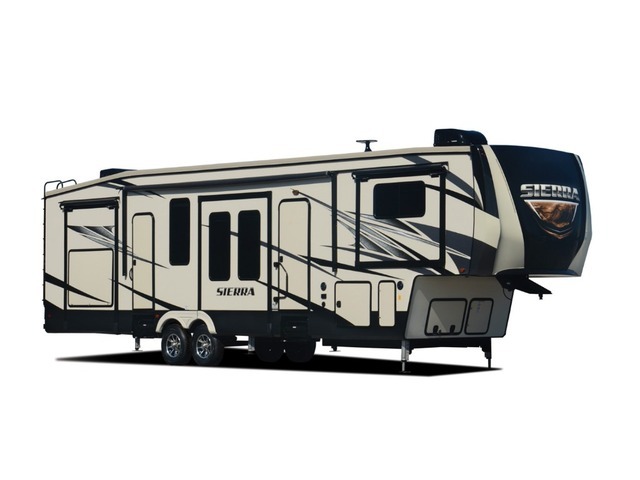 Sierra offers the recreational vehicle family a great line up of quality-built travel trailers and fifth wheels. The professionally designed and appointed interiors give Sierra a warmth and character found only in more expensive counterparts. You'll discover a wide range of options and floor plans that will personalize your RV and help you create an atmosphere that appeals to you and your family. Dry Weight 10,648 lbs Pin Weight 1,980 lbs Overall Length 35' 7"
Dry Weight 10,883 lbs Pin Weight 2,237 lbs Overall Length 35' 3"
Dry Weight 11,573 lbs Pin Weight 2,319 lbs Overall Length 37' 11"
Dry Weight 11,892 lbs Pin Weight 2,173 lbs Overall Length 41' 3"
Dry Weight 12,962 lbs Pin Weight 2,474 lbs Overall Length 41' 8"
Dry Weight 12,283 lbs Pin Weight 2,235 lbs Overall Length 40' 7"
Dry Weight 12,819 lbs Pin Weight 2,495 lbs Overall Length 41' 8"
Dry Weight 13,131 lbs Pin Weight 2,519 lbs Overall Length 41' 8"
Dry Weight 12,898 lbs Pin Weight 2,618 lbs Overall Length 41' 1"
Dry Weight 13,410 lbs Pin Weight 2,184 lbs Overall Length 42' 2"
Dry Weight 13,132 lbs Pin Weight 2,261 lbs Overall Length 41' 8"
Dry Weight 13,535 lbs Pin Weight 2,537 lbs Overall Length 41' 7"
Dry Weight 12,823 lbs Pin Weight 2,256 lbs Overall Length 41' 9"